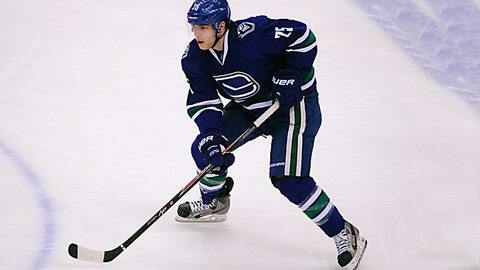 Canucks C Mike Santorelli is out for the rest of the season. Defenseman Kevin Bieksa will miss Vancouver’s five-game road trip leading into the Olympic break, adding another name to a long list of injuries for the Canucks. The team also announced Thursday that center Mike Santorelli is expected to miss the rest of the season after undergoing shoulder surgery to repair a torn labrum. Bieksa played 23 minutes in Vancouver’s 5-2 loss to Chicago on Wednesday night, and then missed practice on Thursday. Assistant coach Mike Sullivan said it’s more than just a maintenance day. Fellow defenseman Christopher Tanev also is out with what’s believed to be a broken hand. Captain Henrik Sedin has missed the last five games with an upper-body injury, but Sullivan thinks he will be back soon. ”He’s still day to day, but I believe he will join us on this trip and we are hopeful that we’ll get him at some point here,” Sullivan said. The injuries have taken a toll on the sputtering Canucks, who have lost three of four and 11 of 15. They have been held to two goals or less in nine of their last 10 games. Coach John Tortorella also has one game left in his six-game suspension for trying to get into Calgary’s locker-room after a first-period line brawl Jan. 18. Tortorella will sit out Friday game’s at Winnipeg before returning Monday against Detroit. The 28-year-old Santorelli had 10 goals and 18 assists in 49 games this season. He was injured Jan. 16. The loss of Bieksa also is a significant blow. He has four goals and 15 assists in 55 games this season. The 32-year-old Bieksa will be replaced on the blue line by Frank Corrado, who was recalled from Utica of the AHL. The 20-year-old Corrado played six games for Vancouver earlier this season but has yet to register a point.